"My husband Matt thinks this is the best turkey recipe since his mother's Thanksgiving turkey. It also works with chicken breast. Try adding your favorite vegetables." Place the turkey breasts in a medium pot of boiling water over high heat. After about 5 minutes add the diced carrots and cubed potatoes to the pot and boil all for about 5 more minutes. Drain the water and transfer the vegetables to a medium bowl. To the bowl add the peas, mushrooms, onions, chicken soup and mushroom soup. Cube the cooked turkey breasts and stir into the mixture. Mix together well and spread the mixture into a 2-quart casserole dish. Top with the coarsely crushed saltine crackers. Cover and bake at 350 degrees F (175 degrees C) for 30 to 40 minutes. Excellent meal! I threw just about all the leftovers from Christmas dinner, including gravy with the soups and it turned out delicious! 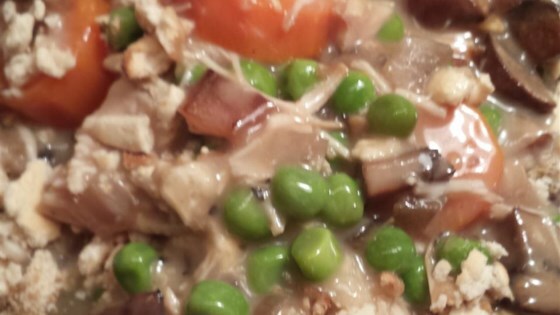 Very easy to make....my husband called it a "turkey pot pie"
Very much like a turkey pot pie without the crust. I added some milk to cut the condensed soup. It was tasty but a little too salty for me. Next time I will use low sodium soups. This recipe is great! It's my boyfriend's new favourite as well!